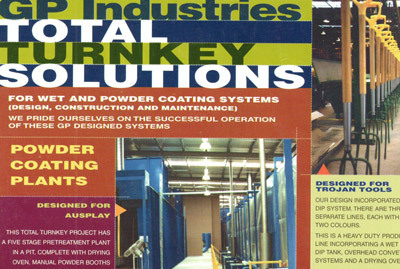 Certain processing firms use the powder coating and e-coating names interchangeably. After all, both parts finishing techniques use electrostatic charges, and they both use curing ovens. However, there are processing differences at work. 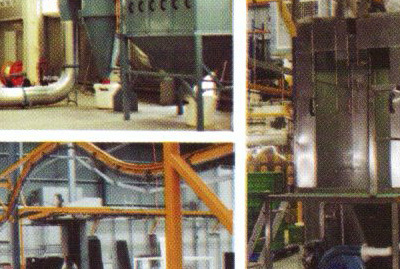 For example, electrocoat and chemical dipping plants are typically bath-oriented production lines, not powder coating cubicles. Furthermore, an e-coated product uses a cathodic epoxy, which occupies a large vat. On pulling back from the production area, the mounted workpieces proceed down the line on an overhead carriage system, somewhat like the conveyors and hooks that transport powder coated parts. Midway through this carriage line, the parts are immersed in the epoxy, with the full-body bath ensuring optimal coverage. Again, there are more similarities in play here than anything else. That coated part is already fluidized, though, so it essentially employs the curing oven as a hardening aid, one that creates an epoxy-tough membrane. Basically, the three bath system and epoxy resin separate the two procedures. Initially, the electrocoating equipment cleans the parts in a chemical dipping bath, then a phosphate conversion coating acts as a preparation layer. From here, the carriage system takes the workpiece to the second bath, to the charged epoxy vat. Finally, once the pieces are properly coated, they're rinsed, with the remnants returning to the process so that they can be recycled. Equipped with this recycling mechanism, the e-coating procedure obviously values an ecologically sound chemical coating approach. 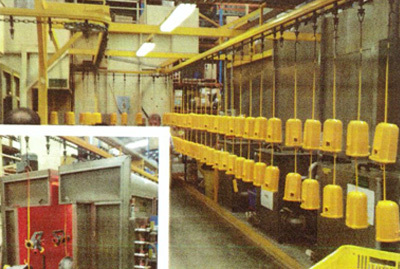 E-coating and chemical dipping plants assure greater coverage. The immersion stage just guarantees the fluid epoxy will flow into the tightest recesses on a geometrically complex part. However, there are powder coating baths, plus powder coating guns are always developing to offer finer, more uniform coverage. Both processes are obviously popular, with the electrocoat style winning out in the majority of automated assembly lines, including the robotic plants that paint many of the globe's finest automobiles. Still, powder coating systems are every bit as market-competitive, with their kaleidoscopic selection of textured and weather-resistant finishes acting as a dry finished, environmentally friendly solution that protects everything from small engine parts to large fencing poles.